As part of an Intel AMT deployment I needed to update the BIOS on our Dell OptiPlex desktops and Latitude laptops. I created a package to run the BIOS update and added this to the operating system task sequence. 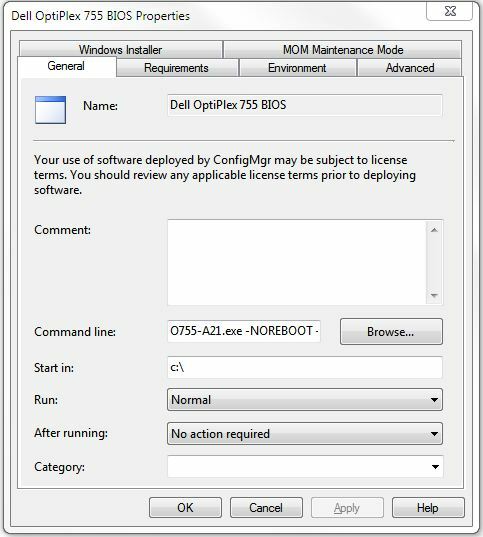 Firstly, download the BIOS update from Dell technical support http://support.euro.dell.com/support/ The BIOS file will be named something like 0755-A21.exe . This is the A21 BIOS revision for the Dell OptiPlex 755. Next, in System Center Configuration Manager (SCCM) create a standard software package. Set the command line to the BIOS file followed by -NOREBOOT –NOPAUSE . This enables the BIOS update to run silently and without rebooting the system. I additionally set the package to run “whether or not a user is logged on” using the setting on the Environment tab. Go to your operating system deployment task sequence and choose Add -> General -> Install Software. Select the BIOS update package. 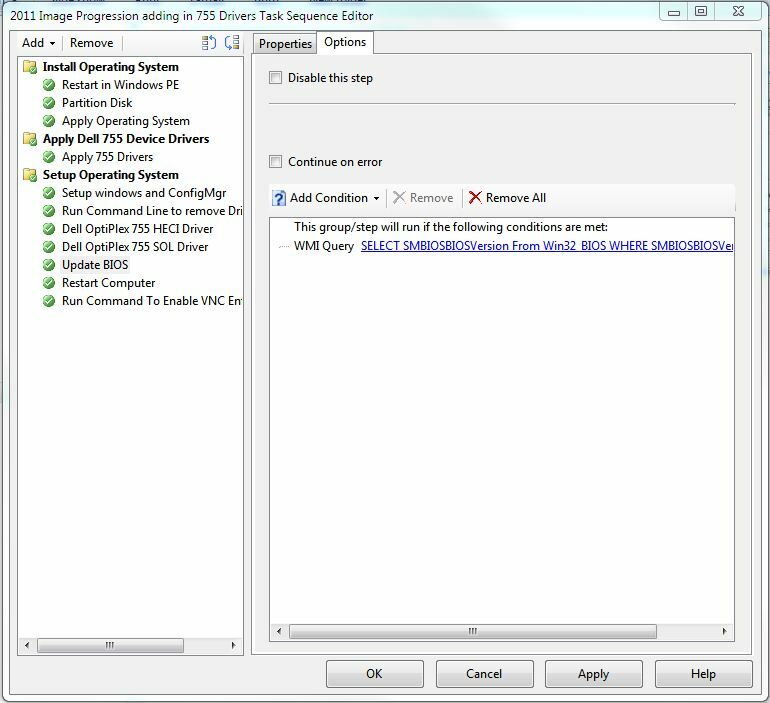 Next, click into the Options tab and click “Add Condition” and select “Query WMI” and enter SELECT SMBIOSBIOSVersion From Win32_BIOS WHERE SMBIOSBIOSVersion < “A21” Replace A21 with the BIOS version you’re using for the update. This WMI Query ensures the BIOS is flashed only if it’s older than a given version. I then have a restart task to reboot the machine and flash the BIOS.